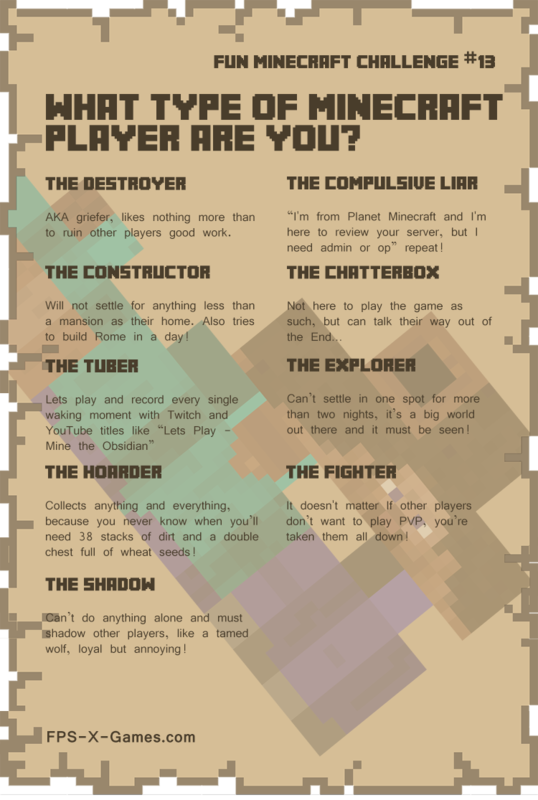 Number 13 Fun Minecraft Challenge, what type of Minecraft player are you or your friend? AKA griefer, likes nothing more than to ruin other players good work. “I'm from Planet Minecraft and I'm here to review your server, but I need admin or op” repeat! Will not settle for anything less than a mansion as their home. Also tries to build Rome in a day! Can’t settle in one spot for more than two nights, it’s a big world out there and it must be seen! Collects anything and everything, because you never know when you’ll need 38 stacks of dirt and a double chest full of wheat seeds! It doesn't matter If other players don’t want to play PVP, you’re taken them all down! Can’t do anything alone and must shadow other players, like a tamed wolf, loyal but annoying!